All Toyota Sports Center Coaching Staff are members of ISI, PSA and/or USFS. Rates quoted are for a 20 minute lesson. You can either choose from our professional staff and contact them directly, or you may fill out the private lesson request form and return it to our office. Frank Carroll ($50) The only figure skating coach to hold the title “Olympic Coach of the Year”. Mr. Carroll’s students have won Olympic medals, World Championships & National titles, & include; Gracie Gold, Michelle Kwan, Linda Fratianne, Christopher Bowman, Tiffany Chin, Mark Cockerel, Timothy Goebel, Evan Lysacek, Jennifer Kirk, Mirai Nagasu, Denis Ten, & Carolina Kostner. He has been inducted into four Halls of Fame: US Figure Skating, World Figure Skating, Professional Skaters Association & International Skating Institute. Barbara Blada ($35) USFS National Synchro Competitor. Over 11 Years coaching experience. 2-Time USFS National Synchro Coach. Coaches all ages and levels of single competitors. Specializes in Jumps & Spins, Moves in the Field, Synchronized Skating, and Off-ice Training. Encourages respectful and positive behavior both on and off the ice. Tanya Burke ($35*) USFS gold medalist, with extensive ballet training. Tanya has toured internationally as a skater & dancer. She specializes in choreography & bringing out the skater’s artistic expression both on-ice & off-ice in ballet classes. Tanya enjoys working on Moves in the Field while improving the skater’s line, extension, poise & grace. She holds a BA from UCSB in Psychology & has over 20 years teaching experience. Tiffany Chin ($40) 2-time World Medalist, Olympic Team Member, US National Champion. Trained by Frank Carroll, John Nicks, Janet Champion and Don Laws, Tiffany carries forward a combined legacy from her esteemed coaches. 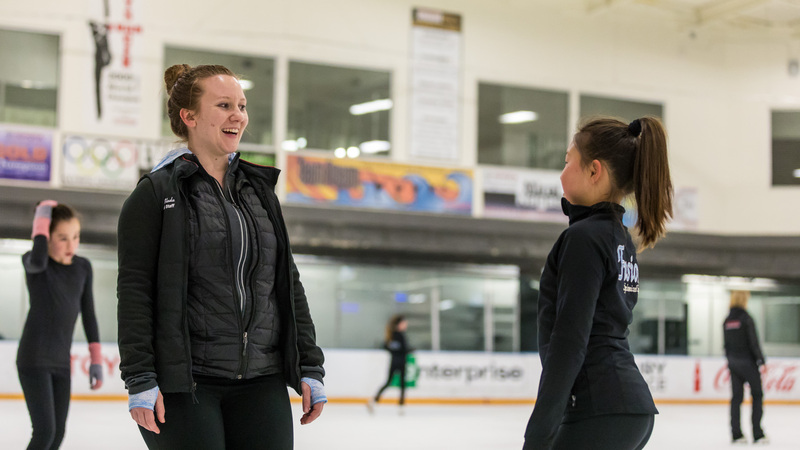 With over 18 years of coaching at local, national and international competitions, Tiffany brings her detail-oriented approach to building a strong, all-around skater with a complete set of skills. Vitaliy Danylchenko ($40*) 2-time Olympic Team Member, European and World Competitor, 5-time Ukrainian National Champion. Coached National and International competitors. Specializing in skating skils, jump/spin techniques, and on/off-ice conditioning. Christa Fassi ($50) Coached four skaters to Olympic gold medals as well as five World Champions & many National, World & European medalists. Accomplished skaters include Peggy Fleming, John Curry, Robin Cousins, Dorothy Hamill, Scott Hamilton, Jill Trenary, Paul Wylie, Nicole Bobek & Carolina Kostner. Christa has her Level 10 ranking from the PSA, and will be lending her energy & expertise to help develop skaters of all levels. Carole Fortini ($35) USFS Gold Medalist. Extensive dance and skating background, and has toured nationally & internationally. Choreographed numerous professional shows including Knott's Berry Farm. Teaches all levels andages of ISI and USFS skaters. Specializes in jumps, spins and Moves in the Field. Teaching for over 30 years and holds a BA from Northeastern University. Linda Fratianne ($50) 2-time World Champion & Olympic Silver Medalist, Linda believes that it is important to love what you do and to find your passion. Linda loves skating, & coaching gives her a chance to share her great knowledge & passion of figure skating with all ages of ice skaters. Staci Green ($30*) Staci specializes in developing a strong foundation by teaching proper fundamentals, Jump & Spin technique in a positive, fun environment. Her skaters enjoy developing their presentational skills through her teaching of music interpretation, & artistic expression though choreography. Staci has 12 years of coaching experience and is a member of USFS, ISI and PSA. Yuriy Kocherzhenko ($40) Olympic Team Member, World Competitor & Ukrainian National Champion. 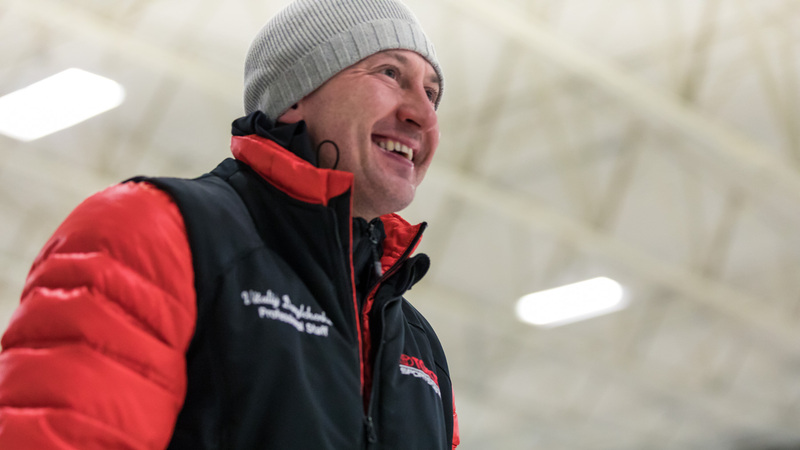 Yuriy is a national & international coach, specializing in skating skills, power stroking, ice dance, on & off ice conditioning, Moves in the Field, footwork & choreography. Lili LaMar ($35) US National silver medalist in ice dance. Danish Ice Dance National champion and international competitor. Lili has training in freestyle, pairs, and ice dance. Lili is passionate about choreography and off ice techniques to help skaters find a unique style on the ice. She has 18 years of dance experience in hip-hop, ballet, ballroom, and modern. Strength, conditioning, and nutrition are one of her top focusses off the ice. Bebe Liang ($35*) International team member since 2001 & World Team member in 2008. 12-time national competitor. Bebe teaches every part of skating from edges to spins to jumps. She also provides choreography for competitive freestyle programs. Saori Minami ($35*) 13 years of competitive experience. 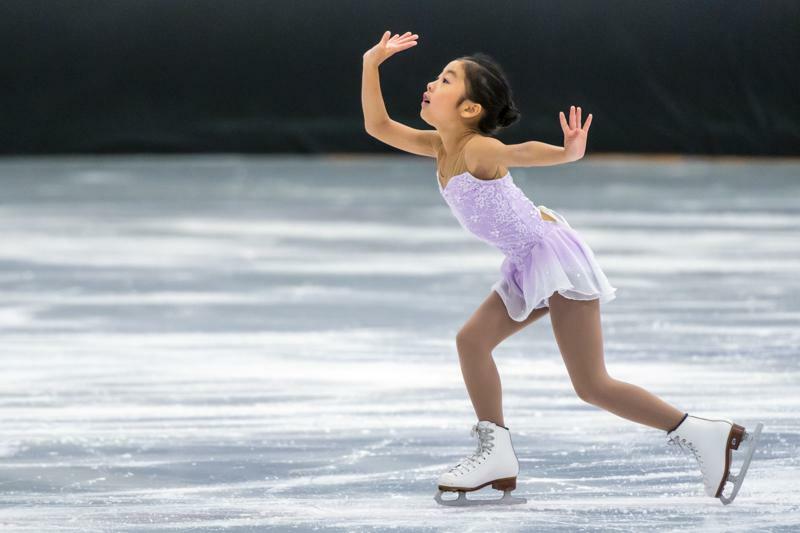 Gold Medalist in the Japanese Figure Skating Federation as well as National Competitor, solo & ensemble performer with Disney on Ice. Coaches all levels & ages. Allison Marie Ramos ($32*) 2-Time nationals ISI Synchronized Skating Coach. Over 25 years of figure skating experience and professional coaching. Specializes in Freestyle, Ice Dancing, Choreography, & Tot & Junior Youth Synchronized Skating. BA Criminology, Law & Society from UC Irvine. Known for her positive teaching & sharing her passion to skaters of all ages & levels. Michael Sasaki ($35*) Over 20 years of figure skating experience. National and international competitor and USFS gold medalist. Performed and toured with several ice shows. B.A. in Social Behavioral Science from Soka University of America. Passionate about helping skaters develop a positive mental approach to their training. Ellicia Shepherd ($35*) USFS single and pair competitor & Gold Medalist. Coaches all levels & ages, both USFS & ISI. Over 30 years professional coaching & ice show experience. Performed & toured in over 30 professional ice skating shows. Specializing in pairs skills, as well as jump & spin technique. Tiffany Shih ($29*) 12 years coaching experience specializes in synchronized skating & Moves in the Field. Member of Synchro Novice National Champion Ice Mates and 5 years with Internationally ranked Synchro team Haydenettes. Robert Taylor ($40*) USFS Gold Medalist in Singles, US Novice Men’s Champion, 34 years of coaching experience,Coached National & International competitors. Specializes injump & spin technique & improving skaters overall technique & quality of skating. Ashley Tike ($30) Over 5 years of experience coaching all ages and levels of skating. Double USFS Gold Medalist in Ice Dance and Moves in the Field. Has 14 years of competitive experience and 12 years of ballet, tap and jazz training. Former Team North Dakota Synchronized Skating Team member. B.A. in Communications from the University of North Dakota. Danielle Ugarte ($35*) USFS Coach for 15 years. 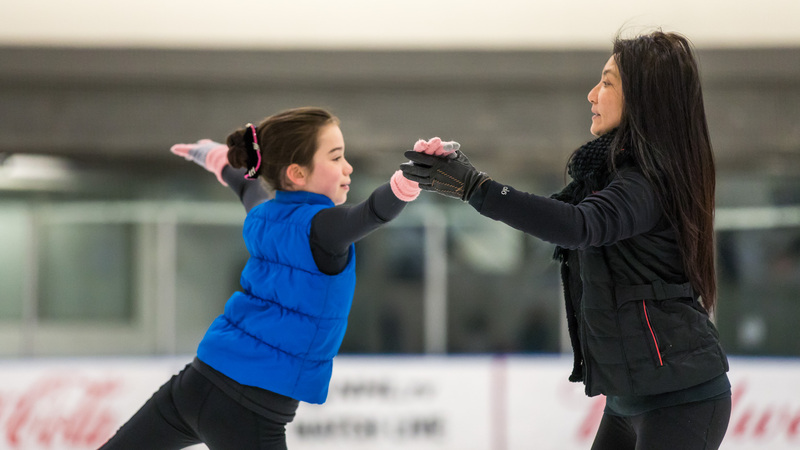 Coaching for all levels of USFS & ISI freestyle skating. Specializes in choreography, spinning & jump technique.Teaches the Mental Keys for competition as well as beginning skaters. Concentrates on the importance of hard work, discipline & enjoyment. BS Television Production. Maksym (Max) Varenyk ($30) Winner of numerous Ukrainian Championships and Junior Cups. Was awarded Masters of Sports of Ukraine. Performed in Russian Stars On Ice, "Kaleidoscope Ice Spectacular" by Willy Bietak Productions in Hong Kong and ice skating show "Cool Art Hot Ice" on board a cruise ship. Brianna Weissmann ($35) Double USFS Gold Medalist in Freestyle & Moves in the Field. US National and International competitor & principal ice show performer/choreographer. Coaches all aspects of skating, choreography and ice artistry. 15 years of ballet & other dance styles. Gabriella Weissmann ($35) US National competitor. She has 15 years of competitive experience & various dance training. Gabriella is passionate about jump/spin technique and moves in the field. She is a certified personal trainer & specializes in on/off ice conditioning and mental toughness. Gabriella was an NCAA Division 1 athlete and implements a variety of individualized training tools to improve her skaters daily training routine.